The Future of the Book is Unfinished: John Sundman's "Biodigital"
It used to be that a book was finished. Set the lead type and that was the book, for better or for worse. In some ways that's a virtue- the authors' pregnancy was finite; the labored give and take with publisher and editor would result in a pretty package of ink on bound paper. But at the same time it's a liability. Non-fiction books become obsolete as time leaves them behind. The artistic process isn't neat and clean. For great works of literature, generations of graduate students pore over notebooks, letters and ephemera to try to figure out what the great artist really meant, maybe it was just a big fish? I find that the most interesting things going on in the ebook world now are being done by people who see books as continuing processes that need not be contained within EPUBs or frozen into PDFs. I notice that these creations fit poorly into today's book publishing machine. Formats go flat, conventional copyrights do copy wrongs; ISBNs go bonkers, bookstores start selling teddy bears and libraries look the other way. Which brings me to John Sundman's Biodigital. Oh my god it was good. As a reader, I found it profoundly disturbing. Disturbing the same way I felt the first time I experienced an earthquake. Having grown up on the east coast, earthquakes were abstractions to me. On moving to Palo Alto after college to take a job at Intel, earthquakes became something we joked about in the fab as we heated silicon wafers to 1200°C inside monstrous quartz tubes. I vaguely thought it would be fun to feel the earth shake. The next year I was a graduate student at Stanford and I felt my first real quake, the one centered in Coalinga. At first it was exciting, but then, as the ground started to roll, I began to worry if it was going to stop. When it was over, my cognitive relationship with the ground had changed. I had never doubted its solidity; suddenly I knew different. Books aren't carved in stone any more. They are mutable. There, I've ruined them all for you. And there's a deadly earthquake in Biodigital. Whoops, I spoiled that one for you too. Biodigital is a remix. About 60% of it came from Sundman's earlier novel, Acts of the Apostles, or so he tells us. 40% of Biodigital is new. I've not yet read that Acts, which makes me one of a very small number of people who have read Biodigital first. (I'll report back after reading Acts.) That subversive knowledge nagged at me through the whole book. "Was this chapter newly written, or was it 'original'?" Also, is the reader meant to know the book is remixed? What's supposed to be real in the book? There's a fictional corporate lab, Emverk, in Biodigital that's clearly supposed to be Xerox PARC, but does that make the fictional company real? Why do I care? You may not share my paranoia of fictional reality if you read Biodigital. Because the reality is extremely vivid and fast-faced. At one point I had the notion that the book was written expressly for me, with inserted references to places I've been, things I've done, and people I've met. I've stood on a ridge on Skyline Drive, I've pored over chip schematics looking for the misplaced hunk of poly causing the glitch on the scope trace; and I've met that crazy guy at the bar in Antonio's Nut House. Somehow I missed that Sundman was there, taking notes. But by the end of the book, things become surreal, dead people start chasing you, and you don't know anymore whether the aromas you were smelling from Peking Garden existed at all. Acts of the Apostles never really found its place in the publishing pantheon. It was Sundman's first novel. And since Sundman worked in technical documentation in the milieu of the pre-web internet, publishing it himself seemed natural. Soon after the licenses were introduced in 2003, Sundman's friend Cory Doctorow convinced him to adopt Creative Commons for his novels, so Acts was just the second Creative Commons novel ever. Slashdot reviewed it and it became a hackerish cult phenomenon, even outselling Dan Clancy, Michael Crichton and Stephen King - for a few hours - on Amazon. Two sequels, Cheap Complex Devices, and The Pains followed Acts. offered to hire an editor, at her expense, to read Acts, write an analysis, and make suggestions for improving it. So I said, “fine”, and she did so, and a few weeks later she sent me the result, and I had to agree that the outside editor had spotted the weak spots in the book and made reasonable suggestions for improving it. The suggestions were basically for fine-tuning the book that’s already written, not for a wholesale rewrite. and so the rights to Acts were sold, and Sundman began working on the book that would become Biodigital. Remixing the raw material in Acts, if you will. Long story short, the indy publisher was sold to another publisher, and the rights to Acts/Biodigital were reverted. So now what to do? How do you go about selling a book that's a remix of another book that's been free? From the buyer's point of view it's very confusing. Which book should be read first? Is Biodigital supposed to replace Acts as the first book in the series? If you've read Acts, do you really want to read Biodigital? From the bookseller's point of view, who's the audience- people who loved Acts? Unglue.it's "Buy to Unglue" program was a good fit for the book. It uses a dated Creative Commons license on the books it sells. So on April 27, 2016 or sooner, depending on sales, Biodigital gets a CC BY-SA license. That means that Sundman isn't the only one who gets to remix the book. You can rewrite it to Pseudo-BioDigital if you want, and release it yourself under the same license, as long as you credit Sundman. It's a "Free Culture" license (albeit not yet) that allows the book to be never finished. 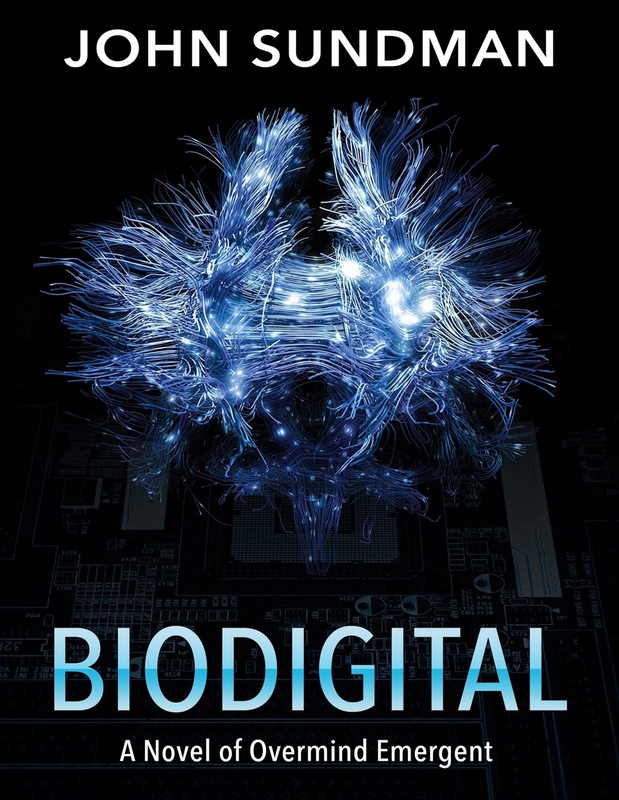 Biodigital is a novel of technopotheosis. Google that word, by the way. It's the process of humans merging with technology to become gods. But don't get the wrong impression. Biodigital isn't about technopotheosis. It's about the reactions of people to the way technology changes us. One reaction is to decide it's fictional. Another is to be scared. And a third is to become a god. Really, we're all choosing, one way or another. So we're merging real technology with real books to make them give them new life, giving them immortality. Bibliopotheosis? Aaron Swartz locks his eyes right onto you at the start of The Internet's Own Boy, the documentary by Brian Knappenberger now on the film festival circuit. I saw it last night at the Montclair Film Festival, where it was received enthusiastically. The Aaron Swartz story says so much about the times we live in (and in the smallish world of techies I've inhabited for the last 20 years). I'm happy that the story has found such an effective telling. Knappenberger's film invites you to look into a lot of eyes, to swim in a variety of gazes. You can't help but to try to understand and assess these people, face to face. Knappenberger's friendly camera work lets you look at people as you never would in real life; the people and the eyes speak for themselves. Swartz's family are the beams and girders of this film. Starting with the home video of Aaron and his brothers as children, we are invited into the Swartz home as old friends. Aaron's brothers, Noah and Ben, provide the voice and tone of the film, which is surprisingly upbeat and full of love. But the ice in Aaron's eyes is alive in both brothers and it's easy to hear Aaron in their voices. The eyes of Aaron's lawyer are soft and weary, his father's eyes are sad. Cory Doctorow, Brewster Kahle, Tim Berners-Lee and Carl Malamud provide twinkles of outrage. Lawrence Lessig never quite looks at us. The eyes of three women in Aaron's life provide the most memorable moments of the film. At one moment Quinn Norton's eyes become round with a fury you've never seen outside a comic book. Taren Stinebrickner-Kauffman's slightly asymmetrical eyes convey wisdom and compel action. And Susan Swartz's teary eyes, on a face with such a strong resemblance to Aaron's, just break your heart. The technical narrative of the film is deft and accurate. A non-techy friend I saw the movie with found the issues easy to understand. I found it interesting that the audience gasped occasionally at things I knew, for example, plugging the laptop into router in the networking closet. And at Aaron's download of Westlaw when he was a student at Stanford. And if you pay attention, I'm on screen for ALMOST TWO SECONDS. The film gets to theaters and Streaming sites on June 27rd. There will also be a Creative Commons licensed version (CC BY-NC-SA). Not the theatrical version though, presumably because of video and/or music clips that can't be released into the commons for licensing reasons. You won't have an excuse not to see that one. And when you see it, Aaron will be staring at you. And then what will you do?